Anybody who writes any thing has dreams of being published.So when I got a mailer from Fuel My Blog about their Christmas project of publishing a cook book representing recipes from around the world of local delicacies Fuel My Blog Community members eat at their homes in their daily lives I started plotting about submitting my fish curry recipe. It was already posted on my Blog.What I needed was a good photograph of the prepared curry.So I prepared the dish just as stated in the Post and requested my brother ,Tajendra, to take a picture of the prepared Curry. And mailed it to the Fuel My Blog.And to my surprise they included it in the recipe book.This is where I thank them wholeheartedly.The reason for the numeral ‘one’ in the title of this post is that I wish them all success in publishing other Global Cook Books with numerals ending at 101 if at all. They have self published the book using cutting edge technology provided by the website Blurb and possible because of the Internet & Computers. Take a look.Tell the world how they have done in your opinion. If you decide to buy remember they are supporting Stop Hunger, a charity .And if you would like to publish some material in whatever numbers then consider Blurb. This time around when you are following a vehicle which urges you to do just that on its bumper-do not press the horn button.Just follow him at his speed.There is no where to go.Have you noticed there is traffic all around you.You can not escape it.You can not beat it to your home/office.Go with the flow.I can make a bet with you now if you do that you will not be frustrated or full of rage waiting to explode at the most slightest trigger.In jaipur of today on a week day you can not safely drive fast to your destination.It can not be done.If you do try it you will make a lot of noise by accelarateing your vehicle’s engine and honking the horn and overtaking on the wrong side.In today’s Jaipur nobody needs it. From this month, Jaipur is going to celebrate a no honking day on one Sunday every month.There is a big need too because the noise pollution levels in the busiest areas are much higher than 50 decibels assumed for a pollution free environment.New Delhi and Kolkatta are already trying out this one day a month of silence to educate the populace in that unending stream of traffic. There was also talk of banning music in the vehicles.Ban loud music from a deck or CD/DVD player but in my opinion the vehicle driver needs the FM radio when he is stuck in an unending traffic jam/commute. Arriving at your wedding by a helicopter is passe.Palace on Wings suggests you woo her with some panache and take your wife to her new home in a helicopter. Plalace On Wings ,a tour operator,based in Jaipur arranged the helicopter ride for the dalit couple so that they could begin their new life in style. 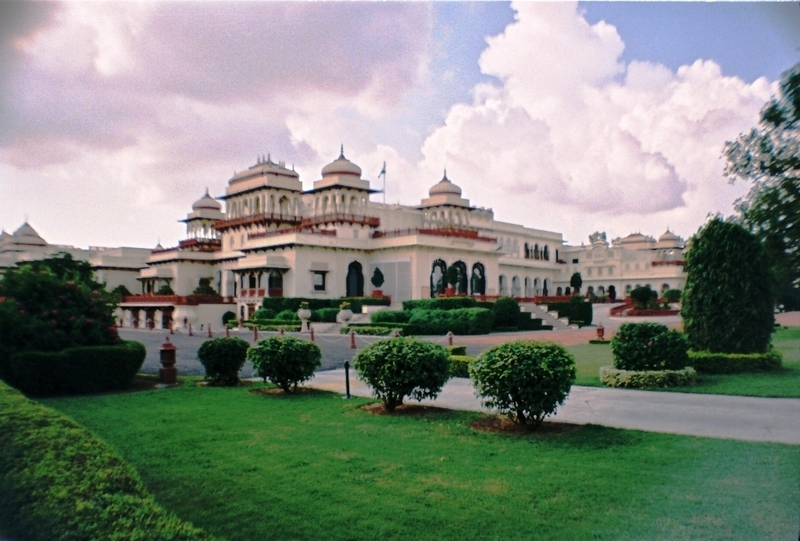 Palace on Wings is promoting its concept of taking you to the select palace hotels of Rajasthan by Helicopter.You visit the best Rajasthan has to offer in the utmost luxury, in the quikest time possible , visiting the maximum sites, in the remotest of places as per your customised requirements . For more than 3 months now 108 very well equiped ambulances have been serving the state round the clock.It is only because of their quick response to an emergency call and well trained staff and modern equipment that they have been able to save more than 251 lives. 95% of the funds for the operation of the 108 service have been provided by the National Rural Health Mission (NHRM). 108 can be dialed from any phone without dialing the station code.This service is fully free of cost and is providing its services to 1.3 crore people. The authorities also propose to ply seven ambulances on the National Highway Nos. 8,11,12 & 14 very soon. Ravindra Manch, Jaipur located in the Ram Niwas Garden was one of the 17 cultural centers envisaged by Pandit Jawahar Lal Nehru in 1961.It was opened to public on 15th August 1963 by the then cultural minister Mr.H.Kabir. It has been newly refurbished by an expenditure of 90 lac rupees.It has all the facilities needed in a theater including an open air theater and ample parking and an art gallery. 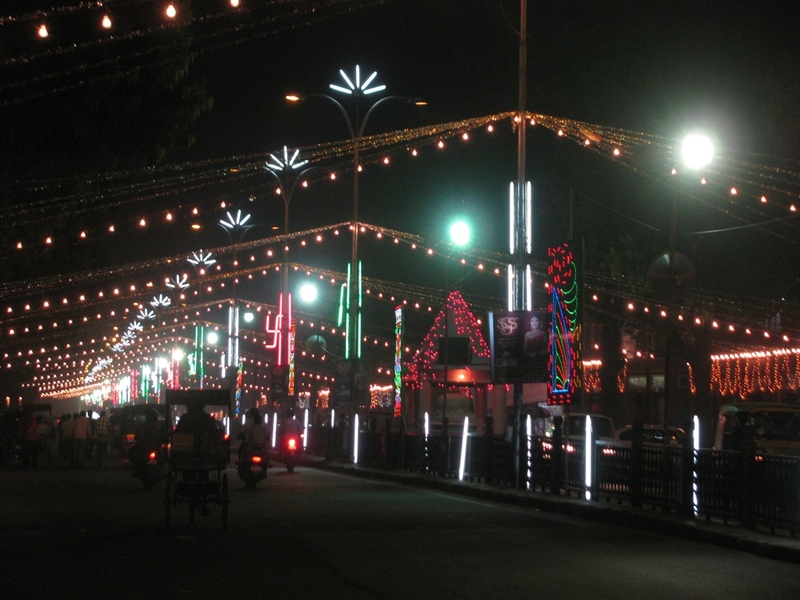 On 8th November 2008 a three day cultural festival was organized honoring the Nobel lauret Guru Rabindra Nath Tagore.It is proposed to hold this festival every year. Jawahar Kala Kendra on JLN marg, designed by Charles Correa, was opened for public by the then President of India, Dr.Shankar Dayal Sharma, on 8th April 1993.It is located on a parcel of land having an area of 9.5 acers and the building is surrounded by lush green landscaped garden.On one side it has a Shilp Gram made in a replica of a cluster of village huts.When you look at the number of facilities it provides to the aspiring artists, artists and local residents alike it is not hard to understand why it is thronged by them everyday.It has an open air theater, art galleries, library,print making shop,audio visual department and an outlet of India Coffee House.Besides this there are cultural programs, exhibitions,plays etc held all the year round. Elephants have been around Jaipur even before the foundation stone of Jaipur was laid.They were being used in the Royal armies and in the Royal shikars.They also helped to build Jaipur. Now a days they are a very popular mode of transport up the Amer hill. The ride is much in demand by the foreign and indian tourists alike.They are also used in the groom’s wedding procession and for playing elephant Polo and in Bollywood films.In a case of Indian ingenuity a local entrepreneur runs a thriving business making hand made paper from Elephant dung. RTDC organizes an Elephant festival around Holi in which Elephant beauty pageants and Elephant Polo and other events related to elephants are organized for the tourists visiting Jaipur and local residents alike. India’s first and the world’s third elephant village( Budget Rs.5 Crores)- the other two are in Kegalla, Sri Lanka and Pattya,Thailand- is almost ready for occupation by its residents. 2km from Amber in the village Kunda off Jaipur-Delhi highway 51 quarters for the elephants, mahawats and their families have been made.Provision has been kept to house all of the about 95 elephants in Amber here at a later date.An elephant veterinary hospital, a cafe,a riding track,large water bodies, a museum and a shilp gram are also proposed.RTDC proposes to develop the village in a tourist spot so that visitors can watch the elephants going about their daily lives. On 21 st October 1959 a unit of Indian Police Force martyred itself defending the Indian soil against the Chinese in Ladhak. Pt.Jawahar Lal Nehru,the then Prime Minister, decided to honour their ultimate sacrifice by declaring 21 st October as Indian Police Force’s Martyrs Day. Smt.Usha Rani Hooja was commissioned with the task of casting a sutiable bronze statue for the memorial. She did every body proud by casting the Trimurty sculpture which was installed at the Narain Singh Circle on the Jawahar Lal Nehru Marg.This memorial was inagurated by the Prime Minister on 5th November 1963.This year also on Shaheed Diwas, a function was organised at the Rajasthan Police Academy and every police line in every district of Rajasthan. Homage was also paid at the Shaheed Samark on JLN Marg.